I have just created www.thoughtsofgandhi.org. Gandhi acting without need of thought: "The thoughts do not come . . . there is no thought about the mission"
Reading a fascinating article about Ramana Maharshi and his opinion of Gandhi (by J. Godman). Ramana actually quite approved of Gandhi apparently, despite the fact that Ramana tended to preach radical non-action -- "What is there to be done?" 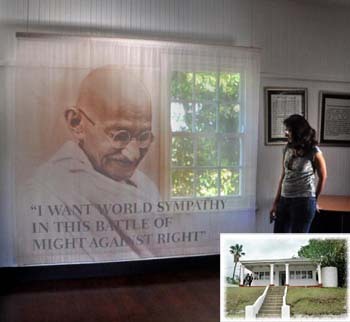 -- and Gandhi was, almost continually engaged in action in the world, and did an astounding amount during his life.